From 2013-2016 when the Unitary Plan was being created I floated the idea of the Super Metropolitan Centre. The idea of the Super Metropolitan Centre was born out of the work Auckland Council Property Limited (now Panuku Development Auckland) did when the Auckland Plan was drafted in 2011-2012. 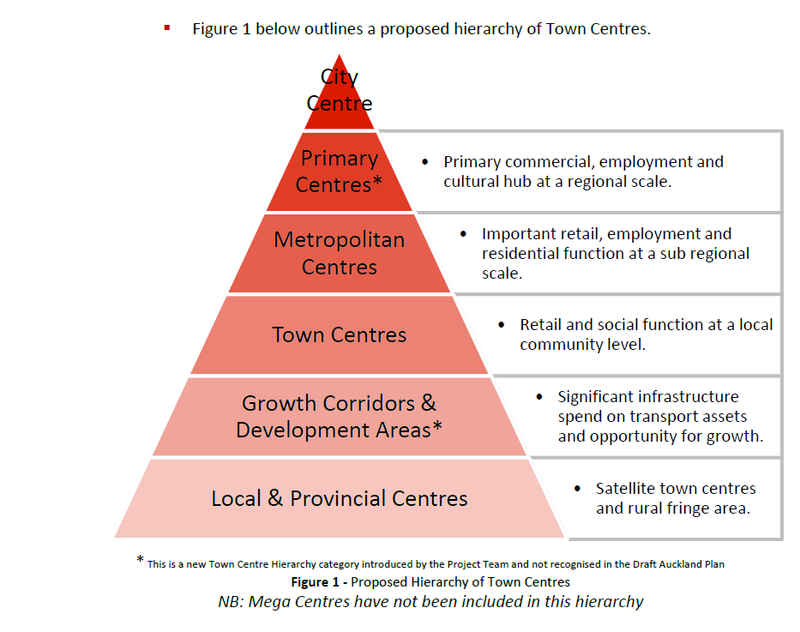 What ACPL recommended was a hierarchy of Centres starting with the City Centre at the top, Primary Centres after that, then the Metropolitan, Town and Local Centres in respective order. Manukau and Albany would be the two Primary Centres. While there is some debate about whether Auckland legitimately has two or three Primary Centres, the conclusion of this report is that there are two centres – one to the South (Manukau) and one to the North (Albany). These Primary Centres fundamentally complement the City Centre in servicing core parts of the region, and reflect the linear geography of Auckland. Manukau has traditionally been a strong area and has developed into a major Primary Centre extensively servicing South Auckland. It would benefit from the overview of the City Transformation Unit. The commitment and focus this brings is beneficial. It sends a signal to the market that Council is committed to continuing investment in order to strengthen Manukau. The significant opportunity the new rail link to Manukau City Centre will provide. This should further boost the preference for office location in this area. Opportunities to improve the walkability of the Centre, and in particular to connect the rail station to the Centre. A more sophisticated entertainment and retail offer. The need to promote a residential base within Manukau City Centre. It is this mix of office and residential use which will give Manukau a 24-hour urban lifestyle. It is recognised that the reverse sensitivity aspects of the airport flight path do complicate residential opportunities. Support the social policy initiatives and approach reflected in the broader Manukau Community and the opportunities the Manukau City Centre derives to support these policies. Over the next 20+ years, the corridor that links Auckland and Hamilton will provide a strong opportunity to harness economic growth in the north of the Waikato and the south of Auckland regions. As a continuation of Section 2.1.1, it is suggested that this growth corridor and the Provincial Towns located in this corridor are a critical element of Auckland’s growth strategy. This corridor should be strongly and formally recognised in the Auckland Plan. It provides the basis for a future “conurbation” encompassing South Auckland and North Waikato regions. Auckland’s economic and population growth must have an interest in, and relationship with, the Waikato and its primary agriculture base as it is so essential to the New Zealand economy. Auckland needs to recognise the opportunity that Auckland’s proximity to the Waikato, as the engine room of New Zealand’s leading industry of international scale and quality (i.e., dairy, agriculture and biotechnology), will provide in the future. There is significant opportunity for Auckland in the economic involvement, support and servicing of this industry. Auckland will benefit from this (as will the Waikato) in economic returns as much as in the opportunity that such a corridor presents to accommodate future growth in the South Auckland/Northern Waikato “super region”. The significant existing investment in rail, road and broadband infrastructure between Auckland and Hamilton also offers significant opportunity for Provincial Centre development along this major transport corridor. Further investment in this corridor may yield large gains for Auckland and relieve pressures elsewhere within the system. The relative merits of leveraging this infrastructure against alternate transport and economic investment is at least worthy of consideration in the next 2-5 years. There is a significant opportunity to provide both residential and business land and to accommodate a material number of businesses and residents over the next 20-30 years. Pokeno and areas south of Bombay are considered to be attractive to the market and the southern growth corridor should consider carefully the impact and importance of such areas. With the main New Zealand market and economy located in Auckland and to the south, vacant land supply south and the connections to primary transport, make the Auckland-Hamilton corridor a critical factor that warrants recognition and close consideration in the future. 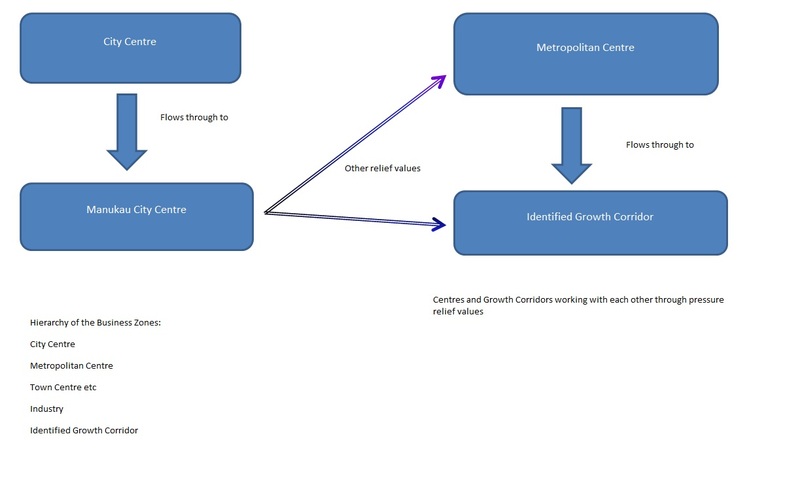 In 2013 I took what then ACPL had done with the Primary Centre idea and from it created the Super Metropolitan Centre. The idea behind the Super Metropolitan Centre was to insert a new tier of Centre between the City Centre and the Metropolitan Centres. While Metro Centres had a sub-regional focus and catchment the Super Metro had a regional focus and catchment however, Super Metros were not of the same size and bulk as the main City Centre. As the submissions and hearings went on I had argued the point behind the concept of the Super Metropolitan Centre and why it was needed. In the end the main stumbling block would be the Auckland Plan itself. As Council never adopted what ACPL suggested with Primary Centres inserting the Super Metro was going to be an uphill task. This is because the Unitary Plan is subservient to the Auckland Plan and for the Super Metro to be inserted into the Unitary Plan it needs to be in the Auckland Plan first. Fast forward to 2017 and the Auckland Plan is under a whole-scale refresh process while limitations of the Unitary Plan have cropped up. As a product of the Unitary Plan more Greenfield growth via the Future Urban Zone was created than was originally envisaged. 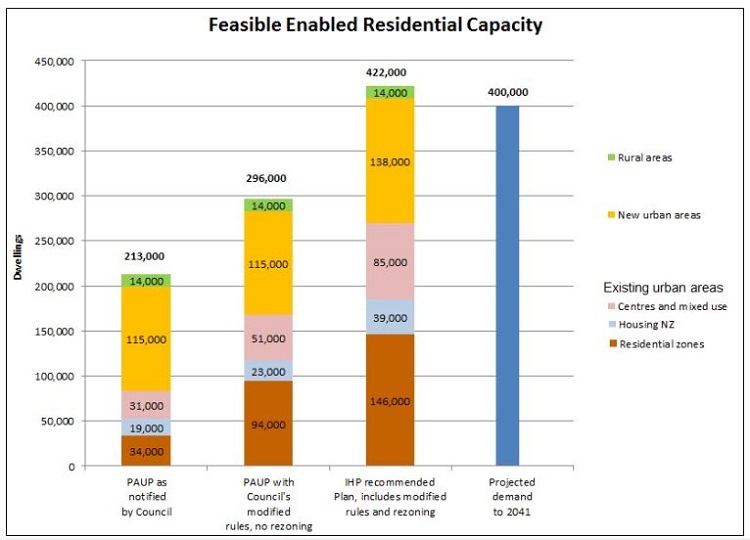 The Unitary Plan had capacity for 400,000 new homes with 160,000 to be in Greenfield zones. However, the then Independent Hearings Panel widened the net of the Greenfield catchment allowing for some 422,000 homes to be accommodated. Recently (and open for submissions until April 24) the Future Urban Land Supply Strategy was created (and currently being updated) to handle the release of Future Urban Zone land into live urban zones allowing urban development. Before I go on I would quickly like to remind people that the Southern Auckland Future Urban Zone capacity is 55,000 homes and 35,000 jobs while Transform Manukau has capacity for 20,000 new residents and equally as many new jobs in both commerce and industry). Now somewhere with all this Future Urban Land Supply Strategy happenings the floodgates opened in the South with a lot more Future Urban Zone land to be flipped to urban zone than originally proposed. This is not a bad thing as the South is in the best position to take growth compared to the North West (lack of busway) and the North (lack of Light Rail). However, it does mean having the eye on the ball in facilitating the growth. With recent announcements of land acquisition to establish a new Town or Metropolitan Centre in Drury (Kiwi’s Announcement With Drury Starts Ball Rolling on New Town/Metro Centre) and developments like Auranga also triggering the demand for a new Town or Metropolitan Centre (Auckland to Receive its 11th Metropolitan Centre? Is the Super Metro Back?) it might be time to seriously consider what we want under of a refreshed Auckland Plan. Presentation slides and reaction can be seen here: The Auckland Donut: A Presentation to the Council Planning Committee. With the development bulge happening in the South what would be the most logical step or steps? I would allow Drury for starters to evolve into a new Metropolitan Centre as I outlined in: Auckland to Receive its 11th Metropolitan Centre? Is the Super Metro Back?. That does mean an 11th Metropolitan Centre would nominally be added however, the Auckland Plan would still have ten. So which Metropolitan Centre got taken out? Manukau City Centre would be removed and elevated into the new Super Metropolitan Centre tier in a refreshed Auckland Plan 2.0. From: Auckland to Receive its 11th Metropolitan Centre? Is the Super Metro Back? So would Auckland get an 11th Metropolitan Centre? 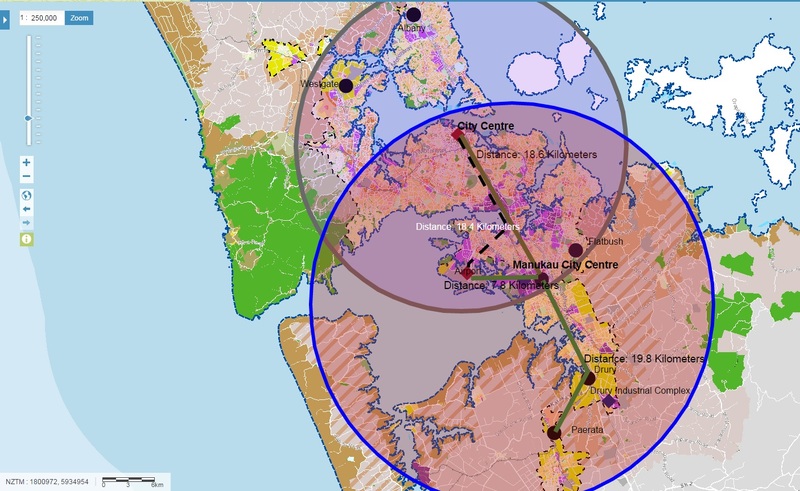 Would it harm Manukau and Papakura? The simple answer is no, a new mall next to a new transport interchange at Drury would not harm Manukau City Centre and its mall. Urban and economic Geographies between Drury and Manukau are different as are their respective catchments. The new mall at Drury would be set in a Town Centre environment while Manukau is set in a Metropolitan Centre environment. Town Centres (like Local Centres but bigger) are designed for a localised catchment where as a Metropolitan Centre is designed for a sub regional (or in Manukau’s case regional and inter-regional) catchment. The size of the catchment will ultimately determine the agglomeration bonus effects – that is what and how much will cluster together in mutual benefit of one another inside a respective Centre. The City Centre obviously has the largest catchment thus the largest agglomeration bonus benefits in Auckland (hence the clustering of services and high density towers). Manukau City Centre would be next on the list with its catchment all of Southern Auckland and the northern Waikato. Consequently from this large catchment it too has large agglomeration bonus effects Drury would not be able to reach (being a Town Centre it does enjoy agglomeration benefits but at a small-scale). I would not expect to find Government department headquarters in Drury but would in Manukau is an example of catchments and agglomeration. Manukau through its catchment would attract more international offerings in terms of retail and hospitality hoping to cash in on the large agglomeration bonus Manukau provides where as Drury necessarily wouldn’t (would favour smaller and local based retailers). Simply put I would go to Manukau for very different reasons compared to going for Drury. Drury I would visit for the “local” shop and quiet catch up at a cafe or local green space. Manukau I would visit for the big retail scene, the wide hospitality scene especially at nights or the weekends, or the civic services clustered in the area. Manukau is undergoing urban regeneration via Transform Manukau with the Metropolitan Centre zone allowing 18 storey residential or commercial towers. Ideally the Manukau Mall would double its size (by going up) to allow space for 400 retailers, a diverse and ethnic food-court scene, plaza space for informal recreation and allowance for residential and office towers above the mall itself. At least then the core of Manukau would be able to service its growing sub region of Southern Auckland more effectively than now. But in the end Manukau and Drury serve very different purposes to each other. As for Papakura Metropolitan Centre? Apartments are slowly being built to give the place critical mass but a lot need to be done streetscape and retail offerings wise to bring Papakura up to its full potential. Southern Auckland housing another Metropolitan Centre would give a signal to residents, businesses and investors the South is the place to be. Also remember we are trying to cut down long distance commutes from the South into the Isthmus to relieve pressure on the transport system. A new Metropolitan Centre allowing intense development over the next three decades would certainly act as a pressure relief value for the South and wider Auckland. That said Auckland could still house ten Metropolitan Centres – with Manukau being elevated to a Super Metropolitan Centre. Yep a year later the Super Metropolitan Centre concept seems to have been revived as developments continue to evolve in the South. If Auckland does receive a new Metropolitan Centre in Drury then elevating Manukau to Super Metropolitan Centre status (reflecting its true regional catchment) would be prudent. Manukau Super Metropolitan Centre would act as both a relief value to the City Centre while also acting at the vibrant heart to Southern Auckland (as outlined in: #ourmanukau Key Move 2: Creating a Vibrant Heart. Part 22 of the #TransformManukau Series). Manukau’s strategic geographic location to the upper North Island gives Manukau regional and even inter-regional clout something the standard Metropolitan Centres lack. I had mentioned this regional and inter-regional clout during the time of the Unitary Plan Hearings however, we were shoe boxed in by how Manukau was seen under the Auckland Plan 1.0. Panuku as I see it with step five have re-illustrated Manukau’s regional and inter-regional role given Manukau’s prime geographic location. With this in mind it is not fair to have Manukau as a standard Metropolitan Centre given Metro’s have a sub-regional catchment while Manukau has a regional and even inter-regional catchment. 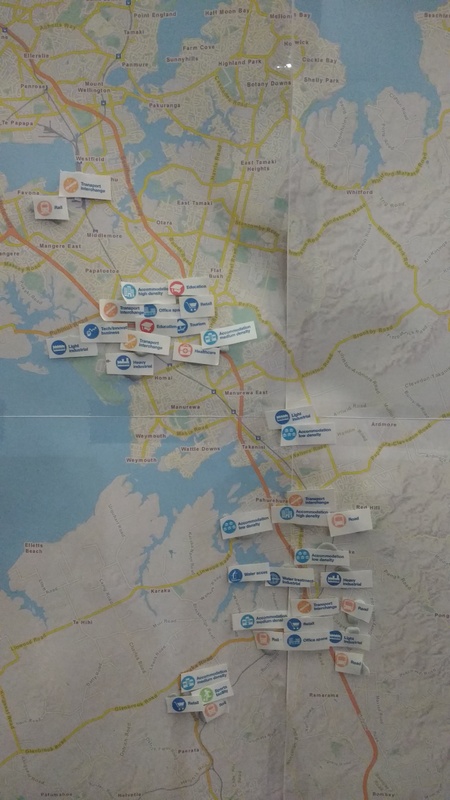 As a result elevating Manukau to Super Metropolitan Centre status given its geographic importance would fit the ideas behind The Donut City concepts I have previously outlined. The leg work for the Super Metropolitan Centre tier is all there ready to be inserted into a refreshed Auckland Plan 2.0. 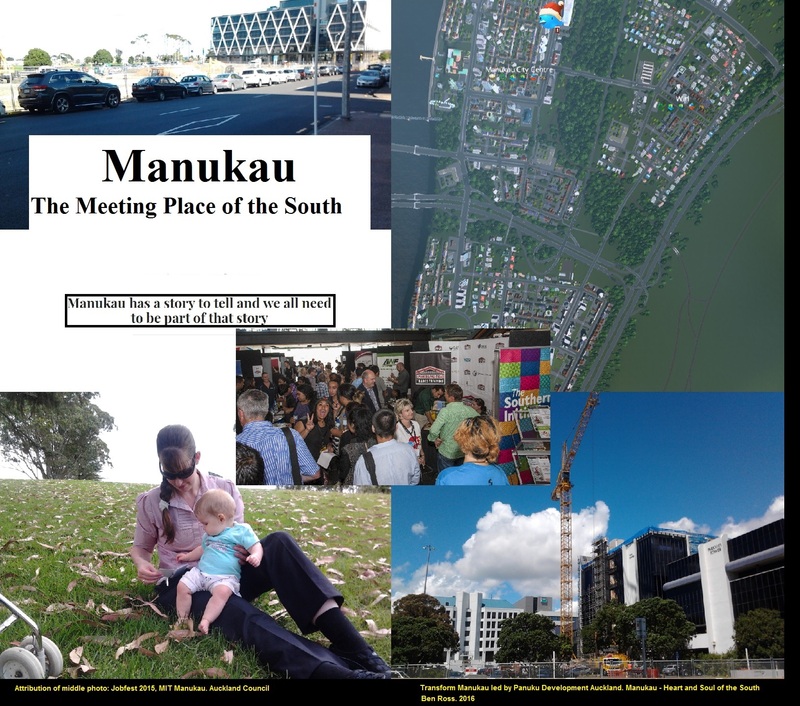 Given current development trends and pressures specifically in Southern Auckland, and the geographic prominence of Manukau as Panuku outlined I do not believe Manukau’s place as a Metropolitan Centre is well suited. Not when Metro Centres focus on smaller sub-regional catchments within Auckland while Manukau’s focus is indeed regional and even inter-regional. Because of the regional and inter-regional nature of Manukau having it elevated into full Super Metropolitan Centre status would be fit the Urban Geography trends both with Manukau itself and developments in Southern Auckland. 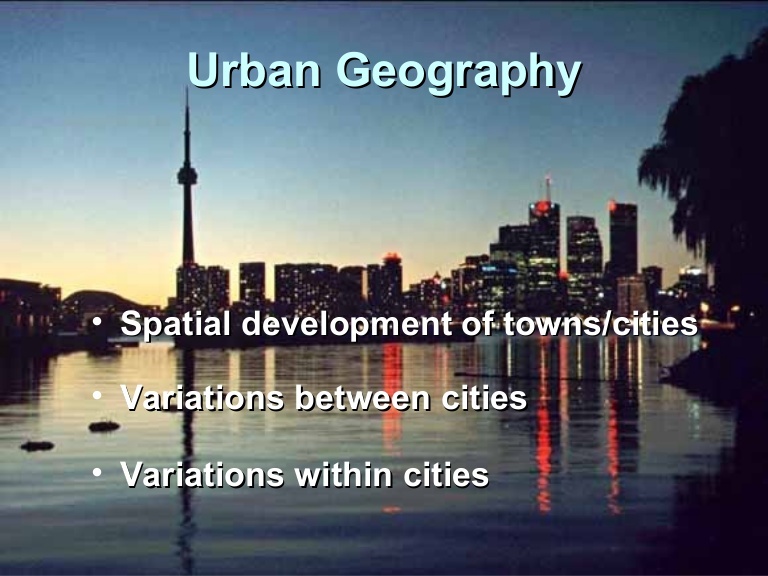 The ultimate question is will Auckland Council recognise this urban geography trend with Manukau and Southern Auckland and finally bring the Super Metropolitan Centre into existence? That was a very long read (ok ok I didn’t read it all!). I’m surprised that Takapuna and possibly even Henderson/New Lynn aren’t part of this? Takapuna certain as it has been the heart of the North Shore for decades (has 4 skyscrapers) and has a reasonable population density with many businesses. Going forward this is likely to become even more so with more mid-high rises etc. Takapuna will also have good access and is reasonably close to the CBD. It all comes down to the Auckland Plan refresh and what Council has in mind. But to be fair Ive only covered the City Centre and the South where I am based and where most of the action is under the Future Urban Land Supply Strategy. I could look at the north and west and might do so at a later date.